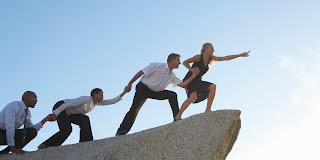 What exactly does a "people leader" do? I happened across something called the 'People Strengths Quiz' online. As the title implies, it's supposed to tell you about your biggest strength as a person. The possibilities were people pleaser, people leader, people guru, and people persuader. This was a test I couldn't "psyche out" the way you can with some instruments like Myers-Briggs, where one can figure out what they're going for and, if you were so inclined, push the test toward the outcome you want. So, whatever the result of this simple instrument, I was going to be a bit surprised, I guess. The test told me that I'm a "people leader." Fortunately for me, that's what the work I've been called to do entails. But the result got me to thinking about leadership, my experiences with it, and my reflections on it. Some people misunderstand leadership, I think. It's not about being the BMOC (or BWOC), the person who barks orders out to others. A leader is, above all, a servant, who strives to help people move from today's point A to a better and preferred point B and beyond. Leaders are also persuaders. Persuasion isn't manipulation from afar. It is, in fact, intensely personal and collaborative. This is true even when the leader has coercive power over those being led. Years ago, I heard Pastor Bill Hybels tell the story of a new member of his church, a retired colonel. The colonel told Hybels that pastors' claims to be leaders were laughable. "When I gave an order," he told Hybels, "people did what I told them to do." Hybels answered, "That may be. But when people don't do what I tell them, I can't order them to get down and give me 150 pushups." There's something to that, of course. But when I told the story to Curtis "Mike" Scaparrotti, now the commander of NATO forces and a son of Saint Matthew Lutheran Church in Logan, Ohio, where I formerly was pastor, he smiled and pointed out: "You still have to be able to persuade." (That's probably why Scap is a general!) He understands something I first heard said by Pastor John Maxwell about leadership: "First people have to buy into you. Then they will buy into where you want to lead them." Once trust is earned, leaders can be persuasive. Another way of describing persuasion is teaching. 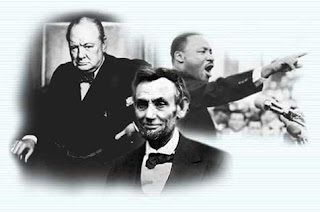 Franklin Roosevelt said that one of the primary tasks of a president is to be a teacher. Presidents (and all leaders) have to take the information they have, distill it, weave it into a vision, and communicate it in accessible ways. 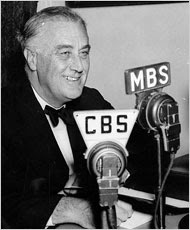 The most challenging lesson FDR had to teach the country during his presidency was about its need to prepare for the possibility of war in light of the rise of fascist Germany and Italy and Imperial Japan. This wasn't an easy lesson for the country to accept. After World War I, the country wanted "a return to normalcy" and isolationism was the rule of the day. Roosevelt slowly taught the country the need for preparedness. Miraculously, during this period, he convinced Congress and the country to adopt the Lend-Lease Program, which helped the British fend off a German invasion of their nation. While the country's military preparedness wasn't where it needed to be when Japan attacked the country on December 7, 1941 and Germany quickly thereafter declared war on the United States, America's teaching president had moved the country closer to being ready for the fight than it would have been had he remained passive. One of the things I learned from my student teaching experience and have continued to learn from my thirty-two years as an educator of all ages in the Church is that the teacher only has to be one lesson plan or two ahead of the students. Leaders have to try to think one to four steps ahead, far enough ahead to cast a vision, but not so far ahead as to lose people. All of which means that leadership is a collaborative process. Leaders who don't vision with those they lead and leaders who don't recruit other leaders to help them implement that vision will soon find that they're leading nobody. Finally, a "people leader" who wants to have a lasting positive impact on others really needs to be in constant touch with God. I think that's true whatever one's field. I try to begin my day five days a week in Quiet Time with God, seeking what God wants to show me, teach me, and call me to do and be that day by digging into His Word. I also pray for guidance. What I've learned is that when we rely on God, He helps us to do what we are incapable of doing in our own power. I'm not sure I entirely understand or agree with the "people leader" categorization in this test, but it caused me to reflect a bit on my role as a leader in Christ's Church and, occasionally, in other contexts. One thing I know for sure is that I've failed many times as a people leader. Some of my mistakes have cost me the trust of people I loved and trusted. I try to learn from my failures and mistakes, seeking God's forgiveness and help to do better tomorrow than I did today. This lifestyle is what Martin Luther (a great leader) called "daily repentance and renewal," turning in trust to the God we meet in Jesus Christ in order to own our sins, receive God's forgiveness, and be reshaped by the Holy Spirit. It's a way of life that can help any of us: people pleasers, people gurus, people persuaders, or people leaders. And everybody else. We offered this as a prayer petition during worship at Living Water yesterday. If you feel so inclined, would you join in offering petitions like this as we move toward Friday? Almighty God, Lord of all the nations, this week will bring the inauguration of a new president. To him and to those who serve in all three branches of our federal government and to thosewho serve at all levels of government in this country, grant wisdom and the faith and humility to act on that wisdom. We ask that all office-holders will be successful not on their terms or on ours, but on Your terms alone. Lord, in Your mercy, hear our prayer. But my Twitter correspondents would have none of it. Like the members of the Flat Earth Society, these atheist tweeters would not be confused by the facts. And there are a lot of verifiable facts about Jesus. 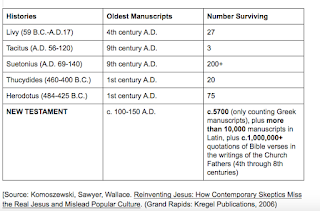 In their book, Reinventing Jesus: How Contemporary Skeptics Miss the Real Jesus and Mislead Popular Culture, three New Testament scholars have a helpful chart comparing the documentation we have for the New Testament, containing our most complete and earliest accounts of Jesus, compared to documents recounting other ancient history. I’m not going to give all the details. I’ll just say that the facts speak for themselves. 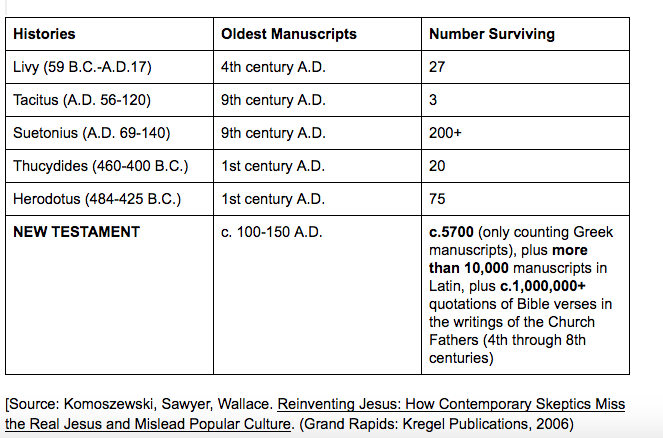 As you can see, we have much more documentation, extending back closer to the days when the events of the New Testament--when Jesus lived, died, and rose--took place than we have of other ancient historical events. The unflinching witness of the early Church for, not just the existence of Jesus, but also of His death, resurrection, and ascension, is more extensive than the evidence routinely cited to document the lives of ancient figures like Alexander the Great and Julius Caesar. But when I pointed all of this out to those atheist tweeters, guess what? Not a single one of them told me that they were convinced. So far as I know, none of them, have come to faith in Jesus Christ. Yet. And I may never know if they do. Sometimes as Christians, our job isn’t to “make the sale” of discipleship, it’s simply to plant the seed. Other Christians who come into those people’s lives may cultivate and water the seed. Still others may harvest it for God. With the apostle Paul, we can say: “I planted the seed, Apollos watered it, but God has been making it grow.” (1 Corinthians 3:6) Our job as followers of Jesus is to keep on in the disciplemaking business. It was after repeated encounters with real people who authentically sought to live as disciples of Jesus that my iced-over heart, my resistant mind, and, toughest of all, my stubborn will began to be pried open to the grace of God and the new life that only comes to us through Jesus Christ. It was the lives and witness of the people of Bethlehem Lutheran Church in Columbus, Ohio, whose humble commitment to Christ through the ups and downs of life and their acceptance of me caused me to want to know more about Jesus Christ and, eventually, in their fellowship, to give my life to Him. This brings us to the central theme from today’s gospel lesson that I want us to focus in on this morning. Take a look at it, please, John 1:29-42. John the Baptist’s witness for Jesus in these few verses should give us the confidence we need to be witnesses for Jesus ourselves. All John did was talk about the encounter he’d had with Jesus and how he had come to see Jesus as the perfect sacrificial lamb sent by God to erase the power of sin and death over our lives. He affirmed his own personal faith in Jesus Christ. From his own relationship with the God revealed in Jesus, John was able to point others toward Jesus. Listen: If you have a relationship with Jesus--if you believe in Him, His Holy Spirit will empower you to tell others about what Jesus means to you. And the deeper you go in that relationship with Jesus--through daily quiet times of prayer, confession, and Bible reading, regular worship, involvement with Bible studies and the mission efforts of the Church, and devotional times with your children--the more you will have to tell about Jesus. A Christian disciple really can’t tell her or his life story without talking about the impact of Jesus Christ on their life story. When we know Jesus, we’re able to share Jesus, whether it’s with family members, friends, classmates, or co-workers. And that’s how disciples are made. What is it that caused those two disciples of John the Baptist to simply get up and follow Jesus? The same thing that will cause our friends, relatives, and acquaintances to follow Jesus when we point to Him. 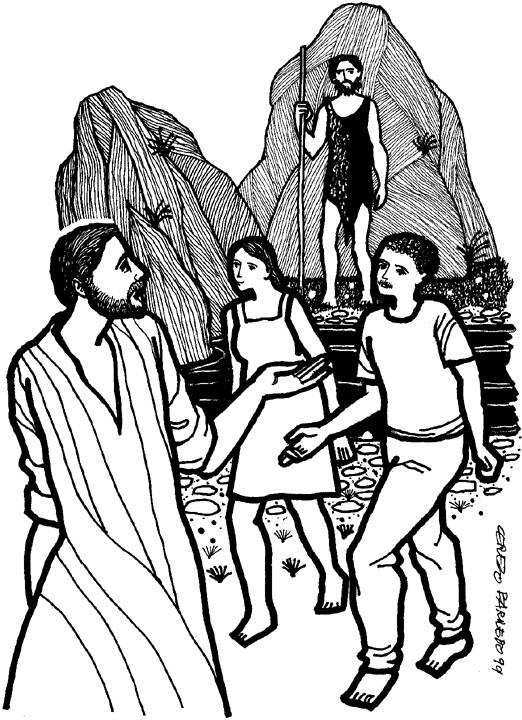 John the Baptist had a relationship with those disciples. John had "street cred." When people know you and trust you, they’ll be interested in your Savior. If people buy into you, they’re more likely to buy into the Lord you follow. Discipleship is born in relationship, not salesmanship. Discipleship is born in relationship, not programs. Being a welcoming church, you know, is all about how you welcome people once they enter your building. For we in the church, our buildings, our sanctuaries, our class rooms, our worship services, our learning events, and our fellowship groups all unfold in our comfort zones, here among people we know. They happen on our home court or our home field. That’s nice. But being welcoming isn’t really how you fulfill Jesus’ great commission (Matthew 28:19-20). 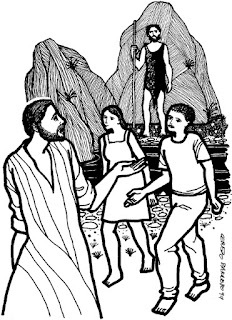 In our lesson, Jesus invited the two disciples of John the Baptist to come and see. Then Andrew invited his brother Simon Peter to check Jesus out. Jesus didn’t wait to welcome people once they showed up; He invited them to know Him better. Andrew didn’t hang around Jesus and wait for his brother to show up; Andrew went to his brother, then invited him to know Jesus for himself. That’s why that Lutheran congregation decided not to be a welcoming church anymore; they decided to be an inviting church. They would grow as disciples themselves and then, instead of waiting for people to show up at their church, they would go out and invite others to know and follow Jesus. Welcoming churches are passive; inviting churches are active. Welcoming churches wait for the unchurched to come to them; inviting churches are empowered by the Holy Spirit to carry the good news of new and everlasting life through faith in Jesus into their communities. Welcoming churches stay in their comfort zones; inviting churches “go in peace [and] share the good news” with the world beyond its doors. Welcoming churches may reach up and sometimes reach in; inviting churches reach up to God, reach in to fellow disciples for growth and Christian fellowship, and reach out to the world beyond that fellowship so that all the world can know and follow Jesus, trust in Him and have His presence in their lives today, and live with God for eternity. This past week we visited our son and daughter-in-law in Texas, where our son is a pastor. One day, he and I walked to a local bakery. While we were there, a young couple walked in and my son, temperamentally an introvert, struck up a conversation with them. In no time, he'd learned that they were new to the area and where they lived. A few moments later, the man had his cell phone out and was showing pictures to Philip. In a few brief moments, Phil introduced himself and who he was and where his church was. We checked out and there were friendly goodbyes. As Phil and I walked from the bakery, he said quietly, "And that's what I do." That's what we're all called to do: To love our neighbor and invite them to come and see our Savior Jesus. In 2017, as we move to more firmly establish a culture of discipleship at Living Water with our partners in the North American Lutheran Church and Navigators, I pray that we all will make the effort to grow in our relationship with Christ so that we become an inviting church, a fellowship of Christians who move into the world with boldness and humility to invite others to “come and see” the Savior Jesus: the way, and the truth, and the life. Let’s not be just a welcoming church; let’s be an inviting church! Let’s ask everyone we know, personally and lovingly, to “come and see” Jesus Christ. Stick to the job at hand, Franklin! I have long been an admirer of evangelist Billy Graham. For years, I financially supported his organization with small contributions. My ministry and my life as a Christian have been enriched by attending two Billy Graham Schools of Evangelism. And, in what turned out to be the penultimate evangelism campaign of his illustrious career, I served on five different committees for the Billy Graham Mission in Cincinnati, held at Paul Brown Stadium. 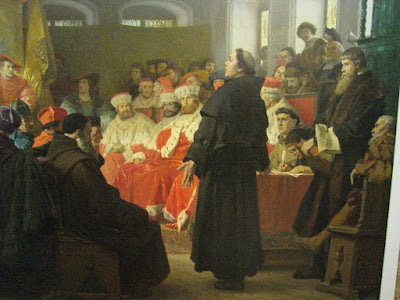 I served (and was the only Lutheran on) the invitation committee that asked Dr. Graham to come to the Queen City. Later, I chaired a regional prayer team, two other teams, and, finally, as chair of the counseling team, that group of counselors who met people who came forward to give their lives to Christ after Graham issued his call to faith in Christ. I've also read and learned a lot from Billy Graham's books like Facing Death, The Holy Spirit, Angels: God's Secret Agents, and others. Billy Graham's preaching and teaching have been a source of inspiration to me from the moment I came to faith in Jesus Christ. Along with Martin Luther, Dietrich Bonhoeffer, Phillipp Melanchthon, Martin Luther King, Jr., and my mentor, Pastor Bruce Schein, Billy Graham is one of my heroes as a Christian servant-leader. But I have become disgusted with the overt political pronouncements being made by Mr. Graham's son, Franklin, now head of the Billy Graham Evangelistic Association (BGEA). 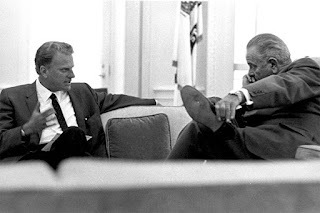 Billy Graham grew close to presidents, of course, especially to Democrat Lyndon Johnson, for whom Graham almost decided to lead the War on Poverty. Graham was nearly as close to Johnson's successor, Richard Nixon. After being used by Nixon though, Billy Graham decided that while he would be available as a pastor to presidents, he would never again allow himself or his message to be co-opted by a political figure. He had bigger fish to fry: to make disciples of Jesus Christ by proclaiming the good news of new life and the forgiveness of sins for all who repent and trustingly surrender to Jesus. When pastors or evangelists get involved with politics, they risk alienating groups of people who associate political parties and candidates with the good news, the gospel, and so reject Jesus with the candidates or parties they don't like. Franklin Graham seems to ignore this lesson learned by his father. (One I've had to learn myself after mistakenly making a run for the state house of representatives while still serving as a pastor.) The younger Graham has recently made statements that seem to intimate that God preferred Donald Trump in the recent election. That's ridiculous. I guarantee that I know as many committed, prayerful Christians who supported candidates other than Trump in the recent presidential election as those who did back the real estate mogul. I think that it's fine for Graham to offer an opening prayer at the Trump Inauguration this coming Friday. I myself have offered prayers for the openings of a legislative session of the Ohio House of Representatives and, more recently, of a session of the Centerville (OH) City Council. We need to pray for public leaders, both in our public and private praying. But both clergy and the Church should stand clear of seeming to stamp the approval of Jesus on particular political parties, policies, or candidates. It's an unauthorized misuse of Jesus' name and it inhibits our capacity to reach others with a far more important message than any that might be offered by any office-holder or political party: The message about Jesus than can transform believers from God's enemies to God's eternal friends. Some day, when I'm no longer involved daily in pastoral ministry (I think I may retire in about ten or twenty years...I'm only 63 and feel as though I'm just getting started! ), I may get engaged in publicly talking my politics. But until then, I'm sticking with commending Christ. I'd rather that one person would come to faith in Jesus through the witness of Christians like me than see fifty million people vote for the candidate of my choice. The reason for that is simple: The candidate of my choice may be a bust, but Jesus will never let anyone down, now or in eternity. Only Jesus can give us life with God that never ends. Just my two cents' worth. Actor Mark Hamill, who voiced the Joker on one of the animated Batman TV series, gives voice to another figure with people he identifies as his enemies, the Trumpster. No matter your politics, this is funny.